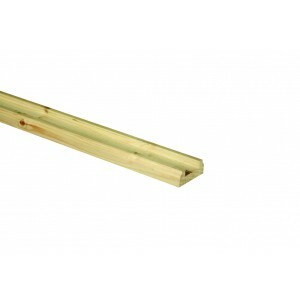 Hallmark Pine baserail sections for use with 41mm spindles. The Hallmark range by Richard Burbidge is a stylish collection of quality pine stair parts. This range offers a choice of either turned or plain 82mm newel posts, available with or without pre-machining for the fixing brackets. The banister system can accommodate 32mm spindles or 41mm spindles, depending on the slot size you choose for then handrail and baserail. Practical and affordable, this is a classic choice of stair parts for traditional interiors, offering great value for money. This system is ideal for both the tradesman and competent DIY enthusiast. Available in three straight handrail lengths, your new staircase balustrade is supplied unfinished, so will require an application of timber treatment to protect it from everyday wear and tear. The unfinished timber also gives you options for painting or staining your stairs to suit your interior perfectly.